Ride Maui's premier glass-bottom boat, the Reef Dancer and explore Hawaii's marine life without getting wet! Fun for the whole family! See the best reef in the area with the help of the professional divers! Set sail for an unforgettable time amongst the coral reef off of the beautiful coast of Maui. As you sit back in air-conditioned comfort, you may see everything from an intelligent octopus, a graceful Hawaiian green sea turtle, or a variety of brilliantly colored tropical fish. This fully-narrated tour will explain all the different facets of the myriad marine life that can be found in Maui waters, as your expert crew answer any questions you may have. Scuba divers accompany the boat to point out interesting creatures and grant you a better, closer view. Amenities: This surface vessel offers a large underwater viewing cabin with easy access to the boat. Boarding involves just a few steps and then there are 9 steps down in the cabin. The open top deck is available for guests at anytime to see the beautiful views of Maui from the ocean and the Maui coastline. No bathroom onboard but there is a public bathroom less than 100 yards from the booth at the harbor. You can book a maximum of 34. See the beauty of Hawaii's underwater paradise! This longer tour goes to two viewing locations instead of just one to explore the magical underwater world of Maui's coastline. Free street parking available on a first come, first served basis. Paid parking also available. No bathroom breaks during this activity. Yes, but we request that you please turn off the flash on your camera. Snacks and food are not permitted on board the Reef Dancer. You may bring a bottle of water with you and there is a water cooler on board for guests to use. Are there restrooms available on the semi-submersible? No bathroom facilities are available on board so be sure to use the bathroom at the Marina. A semi-submersible craft that seats up to 34 passengers. This surface vessel with a large underwater viewing cabin has easy entry stairs to the spacious air-conditioned cabin and the cabin features surround viewing. 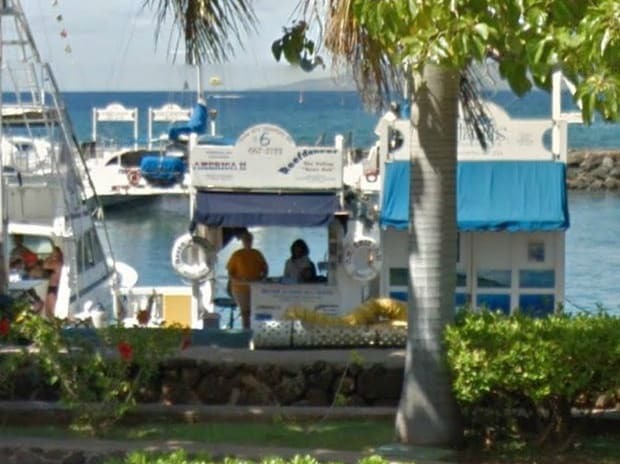 The open top deck is available at anytime for beautiful above water views of the ocean and the Maui coastline. Fabulous! Great people...clean windows - lots of sea life. Scuba divers bring things right up to the windows!